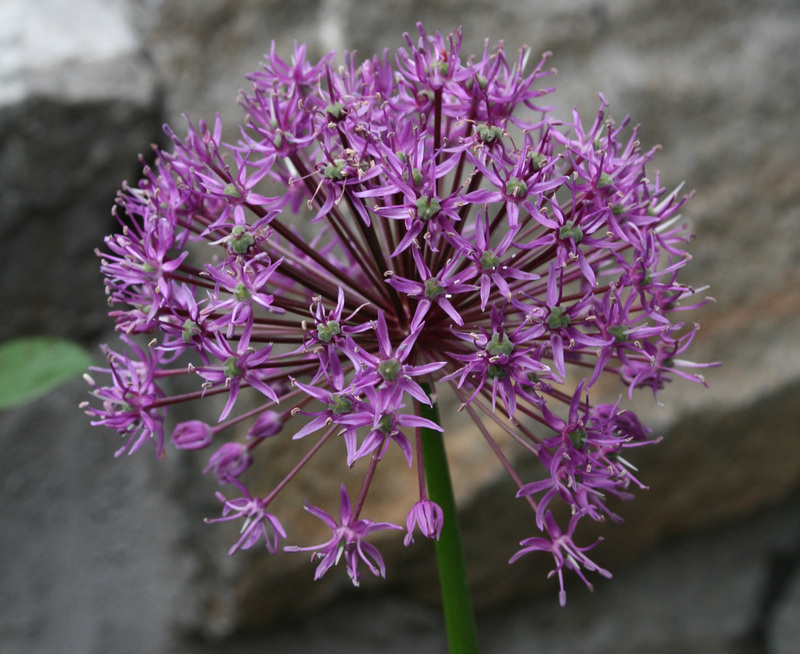 Surprising side effects of pregnancy #1: Ornamental alliums are one of my all-time favourite flowers. I’ve loved these sculptural blooming onions ever since my first trip to the Chelsea Flower Show in 1998, when they were the flower du jour. They starred in almost every show garden that year. I remember writing a column about how they must have been the hottest new trend in floral fashion… only to subsequently discover that the reason these beautiful bulbs appeared in so many Chelsea gardens was because a canny nurseryman had offered the designers as many free bulbs as they liked. And, as it turned out, they all liked them quite a lot thanks! Despite my fascination with ornamental alliums, I’ve only actually planted them twice. The first time was the year after I first went to Chelsea, when I planted Allium giganteum around my rotary clothesline. Bad move: this species has flower stalks up to 2m tall. No sooner had they started blooming than the washing line swung around and decapitated the lot. I figured I’d give them another go this year and planted about two dozen bulbs (pink ‘Mars’, pictured, and white ‘Mount Everest’) from Garden Post. They have been utterly spectacular, which makes it all the more ridiculous that the sight of them is literally making me sick. Yep, you guessed it: since I found out I was pregnant, I haven’t been able to abide the smell of onions. Cooked onions, raw onions – and gorgeous ornamental onions. I have to hold my breath to walk past them in the garden without gagging. Bugger! oh Lynda, you do make me chuckle – no not chuck up, but gather that’s your specialty at the moment. This baby is going to be a fun and loved kid and will probably have to eat it’s veggies no matter what! but oh what a wedding you guys are going to have – never mind, rain storms promised, so good luck with the wild flowers, although Dolly Parton. hmmmm?.. good luck with the onions. It passes – but not going to tell you what happens next – you might chuck it ALL IN! Happy Christmas and keep that sense of humour, you make an awful lot of people happy with it. Congratulations! Pregnancy is full of weird and amazing things. I couldn’t stomach bananas – went completely off them, but craved oranges….oh, and hot chips 😉 Best of luck with the wedding and pregnancy. Hehe, that reminds me of when I was pregnant, I couldn’t bear onions and brassicas. In fact, I had to stop reading the NZ Gardener Mag because everytime I saw a photo of veges I wanted to be sick. I was so glad once the baby was born and I could enjoy food again (and the mag)!